Screwy Decimal: I am vengeance. I am the night. I am...THE LIBRARIAN! I am vengeance. I am the night. I am...THE LIBRARIAN! A few months ago, my boyfriend (who is a big comics nerd) and I attended the Batman at 75 panel, which featured Mr. Kidd, Michael Uslan, Kevin Conroy, Kevin Smith, and my Twitter friend Marc Tyler Nobleman, who put together the panel (and who writes interesting books about Bill Finger, one of the formerly unsung heroes in Batman's history). I'm not much of a comics gal myself, but I found it to be very interesting stuff. 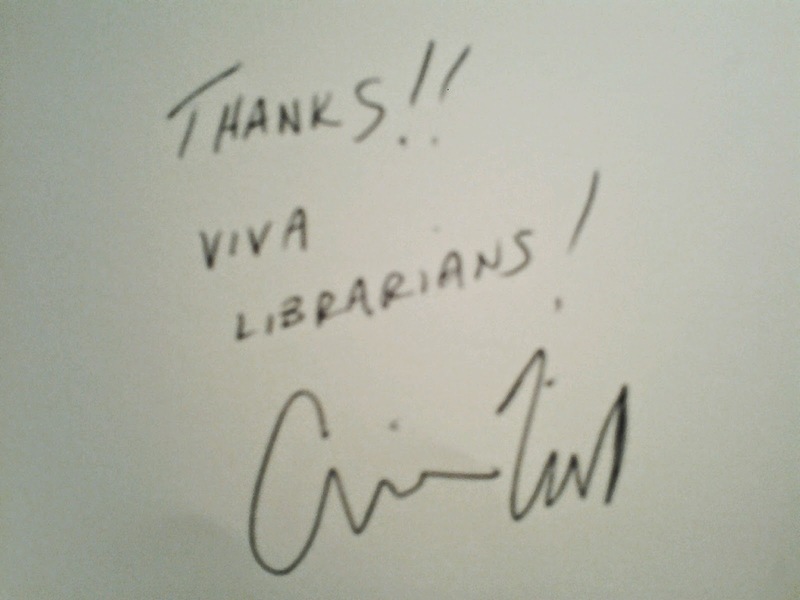 After the panel, there was a book signing, and, as I usually do when I go to signings, I awkwardly blurted that I was a librarian to the signees - luckily, Chip knows what's up. Happy National Batman Day, everyone! Speaking of Batman (as I often do) and speaking of librarians (ditto), perhaps you know that Batgirl had a day job: http://noblemania.blogspot.com/2012/12/batgirl-works-at-library.html.